Car washing mitt/glove is made of microfiber chenille material. 1 x Car Cleaning Glove. Gloves brushing cannot leave any scratch delicate surfaces in your car. Gloves use less water and soap. Easy to wash and dry. 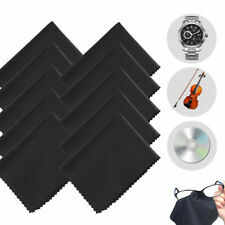 Dual Deck Super Absorbent Microfiber Towel for Car Cleaning. 1 Car Wash Microfiber Towel. Cleans as it dries and leaves no scratch in cleaning process. Super large wash and dry more area faster. Super strong water absorption and strong decontamination. Excellent for auto washing, drying and polishing. 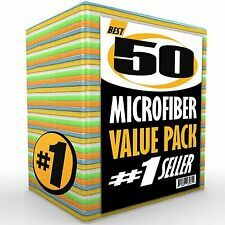 Type: Microfiber Towels. Material: Microfiber. 10 x Blue Microfiber Towels. Perfect water-absorbing cleaning towel. Perfect for cleaning table, window, screen, car, mirror etc. Color: Blue Grey. Material: 80% polyester 20% polyamide. Due to light and screen difference, the item's color may be slightly different from the pictures. Super absorbent, abrasion resistance. Soft and gentle to the surfaces, do not leave washing marks. The surface could be a little natural raw cause that is cut from the shape of the sheep. Wash in hot water, use only natural soap, can it?. Material: Pure Natural Suede. (1) Made of high quality pure natural suede---thick and soft. (3) Ideal for cleaning painted surfaces, silverwear, windows & mirrors,etc. Our warehouse is located in Yiwu, the largest small commodities market in China. (2) Streak free finish, full absorbent. Material: Pure Natural Suede. (1) Made of high quality pure natural suede---thick and soft. (3) Ideal for cleaning painted surfaces, silverwear, windows & mirrors,etc. 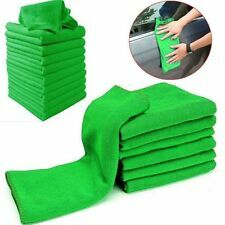 10 x Large Microfibre Cleaning Auto Car Detailing Soft Cloths Wash Towel Duster. Strong absorption,easy to wash and dry. It will cannot leave any scratch delicate surfaces in your car. Note: color sent in random color.We don't accept sendSpecific color item. Type: Microfiber Towels. 5 x Blue Microfiber Towels. Excellent for auto washing, drying and polishing. Material: Microfiber. Perfect for cleaning table, window, screen, car, mirror etc. Perfect water-absorbing cleaning towel. 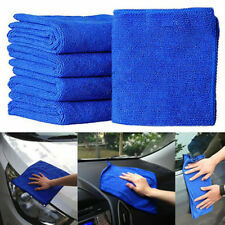 6PCS Blue Microfiber Absorbent Towel Car Clean Wash Polish Multi-function Towel. Quantity: 6PCS. 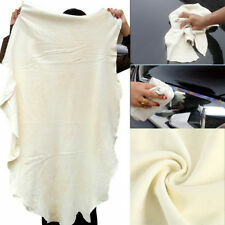 Soft Microfiber Absorbent Car Auto Clean Wash Cleaning Polish Towel Cloth. Wash CAR Cloth Cleaning Towel Wipes Magic Chamois Leather Clean Cham 43*32cmLWY This synthetic-chamois towel is ideal for car and household cleaning. Besides the softness and warmness, it has the useful property of bearing soap without damage. Its most common use is in automobile washing where it may be known as a "shammy" cloth. Its water absorbency makes it good for other uses. Being somehow spongy, it easily retains oil making it good for wiping fingerprints from polished metallic surface. Size:43*32cm Notice: Colour: Yellow,Purple,Blue,Green,Pink this colors we just accept to be random shipments. Super absorbent, abrasion resistance. Soft and gentle to the surfaces, do not leave washing marks. 1 x Cleaning Cloth. Material: Premium oil tanned leather. All pictures are for illustration purpose only and Colours may vary slightly. We've do our best to make the photo more close to the real items. Condition:100% Brand new and high quality Type: Clean Towel Cloth Material: Microfiber Quantity:1 Pcs Size: 60 x 160cm(23"x 63"inch) With great water absorbent ability. Usage: Clean, Wash, and polish your car, your home, or anywhere you used to use traditional towel. Automotive - Excellent for auto washing, drying and polishing. 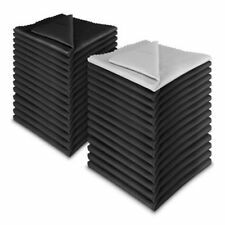 These premium microfiber towels can fulfill your vehicle's interior and exterior cleaning needs Kitchen, household: The unique microfiber clothes can magically lifts dust, dirt and grease away from your cleaning surface without leaving lint, streak marks Great water absorbent ability. Very lightweight and portable to bring it anywhere. Would not make any worn or damage in the cleaning process. Provid. Size: 40x40cm. 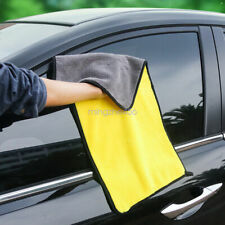 Microfiber car washing mitt/glove. Material: Microfiber. Soft, comfortable and good handle, strong water absorption. Will not leave any scratch in the surface of your car. It is very economical and a wonderful gift to your car. Quantity: 10Pcs. Type: Microfiber Towels. Material: Microfiber. 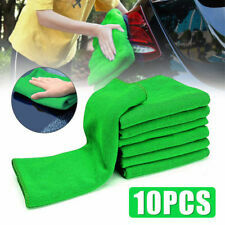 10 x Green Multicolor Microfiber Towels. hope you could understand. Color: Blue,Green,Multicolor. Humanization design, enlarge and thickening, comfortable feeling and excellent water absorption. Made with high quality Coral Velvet, professonal grade premium microfiber mitt, adsorption and aggregation stain. Car washing mitt/glove is made of microfiber chenille material. 1 x Car Cleaning Glove. Gloves use less water and soap. Easy to wash and dry. Soft, comfortable and good handle, strong absorption. Gloves brushing cannot leave any scratch delicate surfaces in your car.